Note: This piece was originally set to run as the cover story in Sip California but due to a publishing delay and the timing of 7% Solution tasting event, I’m posting it here now. As you drive across the wine-growing regions of California, the majority of vineyards you pass will be planted with the big eight-- Chardonnay, Cabernet Sauvignon, Zinfandel, Merlot, Pinot Noir, Syrah, Sauvignon Blanc, and Cabernet Franc. According to the USDA’s report on California’s wine grape acreage, these eight varietals are the most widely planted grapes; roughly 93%. By focusing on the unusual, lesser-planted grapes, these forward-thinking producers are establishing an important knowledge base on Californian wine with regard to soils, climate, and farming techniques. Their efforts may predict the future of what’s in your glass, and herald a significant turning point in California wine. 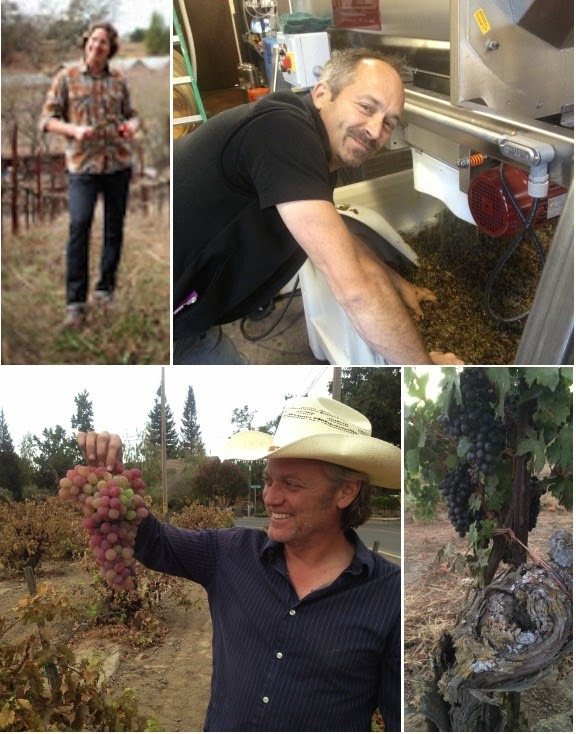 Four of the most passionate advocates for the 7% grapes are Duncan Arnot Meyer of Arnot-Roberts, Matthew Rorick of Forlorn Hope, William Allen of Two Shepherds, and Pax Mahle of Wind Gap Wines. If, as the saying goes, wine is fashion, then these winemakers are the avant-garde designers of the moment, sending Arneis, Counoise, Vermentino, and others down the cat walk with a strut of attitude. “I think we are just beginning to explore the inherent valor of light-bodied red wines in California,” says Duncan Arnot Meyer. His standout wine, the Arnot-Roberts Ribolla Gialla, is fermented in clay amphorae. He also makes a Rosé of Touriga Nacional and Tinta Cao that’s dry and light as parchment with a fresh scent of strawberry and spice. Chasing the tough-to-grow, hard-to-pronounce, and at-times-persnickety varietals rather than follow the tried and true is not necessarily the path to riches and glory. The common denominator among the winemakers is the compulsion to follow their own tastes while pushing the prevailing expectations of what makes wine great. If it pays off, so be it. Instead of making wine to fit a business/marketing plan, Allen makes wine to suit his palate. His love for Rhône varietals grew from a hobby into to a full-blown label, and his Two Shepherds Grenache Blanc, from Saarloos Vineyard in Santa Ynez, has gone on to achieve near-cult reverence. “Our wines are appealing not just because of the variety, but for those seeking wines of restraint, lower alcohol, higher acidity, and finesse over brawn,” Allen says. Pax Mahle’s focus on wines with a sense of place is reflected in his label name--Wind Gap—in reference to the Petaluma Wind Gap a viticulture sub region of the Sonoma Coast where the grapes are influenced by cool coastal winds and “…taste like where they are grown.” His old vine Trousseau Gris, an aromatic delight from Fannuchi-Wood Road Vineyard in the Russian River Valley, is fermented in concrete and available on tap at his grange-chic tasting room in Sebastopol. Many 7% varieties have an ardent following by wine consumers looking for something new, but the masses have yet to embrace the full range of varietals. “People are more intimidated by a $26 bottle of California Vermentino that’s terrific with food than a $75 bottle of Chardonnay that’s so oaky and mass produced it tastes like it could have been grown in a lab,” says Mahle. A minimal approach to winemaking and willingness towards experimentation is a calling card of the avant garde, with many using "old world" techniques like native yeast, neutral vs. new barrel, concrete, no fining or filtering, and picking at lower ripeness levels. Indeed, many of the 7% wines exhibit an inherent lightness of being, alive with an energy that practically bounces in the glass. For Rorick, a minimal approach applies to both winemaking style and case production. The Forlorn Hope wines are labeled as “rare creatures,” and made in lots of less than 2,500 bottles. His Que Saudade Verdelho, from the Sierra Foothills, is full of flavor and vibrant acidity—a veritable poem to the Portuguese provenance of the grapes. It's not dabbling as much as purposeful experimentation with old vines and forgotten vineyards in a concerted effort to learn from the grapes and what in time may reveal what's truly California. “What might our vineyards look like today if Verdelho, Trousseau noir, Riesling, Chenin blanc, Tinto Cão, Arboriou, and other 'lesser-known' varieties had continued to be cultivated in diverse locations and larger plantings over the past hundred years?” Rorick asks. He would be delighted if all of the work being done with fringe varieties in California continued to deepen the understanding and relationship between site and vine, and forge a link between the state’s viticultural history and its future. “Continuing the exploration of this history is irresistibly compelling,” he says. Are the 7% varietals destined to become just a passing fashion trend? The equivalent of wide-legged palazzo pants of the late 1960s? One day you’re in, the next day you’re out. Or will they become generally accepted and long lasting? In the end, the change and shifts in wine culture may not come from the growers and producers, but from the new breed of wine drinkers, that once they get a taste, will drive the demand for more. “These lesser-known varieties offer wine aficionados a much broader world of possibilities and palate experiences, and a chance to appreciate the benefit of old vines and historic vineyards,” Allen says. He sees it as an opportunity for California to distinguish itself, and believes the number of small wineries producing lesser-known varieties will continue to increase. The 7% Solution tasting event was the brain child of Duncan Arnot Meyers of Arnot-Roberts and Sam Bilbro of Idlewild Wines, who wanted to showcase the varietals made from the lesser-known varieties planted in only 7% of the acreage in the North Coast of California. 2015 will mark the third year of this not-to-be missed event. Details on locations and tickets below.